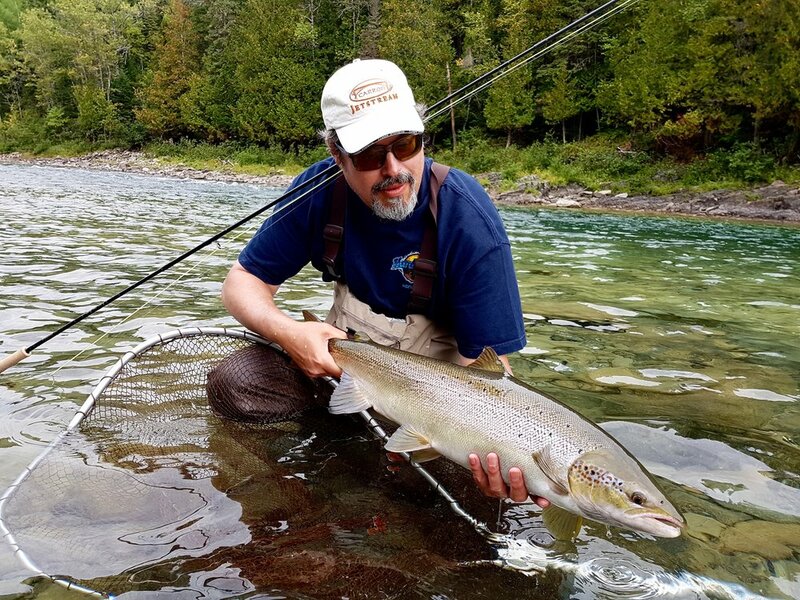 Allan Casson landed this nice salmon on the Bonaventure, way to go Allan! Anne Wood breaks the ice on her first day out on the Bonaventure for 2017 , congratulations Anne. She shares her secrets, what a lady! John Wood with his first of the season, congratulations John! Here's why we like the Red Francis so much. Steff Jones from the UK with his first Atlantic salmon from the Bonaventure, Congratulations Steff! George Chang from Spain with a nice one on the Bonaventure, way to go George! Patrick Levesque on his second trip to Camp Bonaventure this season, Nice one Pat! David Hathaway with a nice one on the Bony, Congratulations David! This was Chris Williams first trip to Camp Bonaventure, he's coming back next year! Jean Francois Routhier with his first Atlantic salmon, this was one of three, not bad for a beginner! Congratulations JF! This was Claude Menard's first trip to the Bonaventure, but not his last! Way to go Claude! Mike and Loir Sullivan are regular s at Camp Bonaventure, nice one Mike, see you both next year! Mac and Dale Fox are really part of our Camp Bonaventure family, here's Mac with yet another fine salmon, See you next June guys! This was Chris Williams first trip to Camp Bonaventure, he's already booked back for next year, congratulations Chris! Peter Collingsworth runs Sport Quest Fishing Vacations in the UK, here's Pete with his first salmon from our side of the pond, Nice one Peter, see you next year. John Watson from the UK with his first Bonaventure salmon, well done John! Stuart Macoustra knows how to catch them, nice one Stuart! Denis Quinn from Ireland with his first one from this side of the pond, Congratulations Denis! Sean Lucas Also from Ireland with a nice Bonaventure salmon, well done Sean! Brian Anderson who owns a fly shop in Ireland hss been a regular at Camp Bonaventure for a few years. Nice one Brian! Gregory Cope,the fourth of the Irish group with a nice salmon for the Bonaventure!, nice one Gregory! Harrison O,connor has been coming to Camp Bonaventure for many many years, he only fishes dry flys, congratulations Harrison, see you next year! Wright Palmer with his first one from the Bony this year, Nice one Wright! James Palmer, like his Dad Wright , knows how to catch them, nice one Jim! The last week of August gave us a mixed bag, rain at the beginning, warm and sunny in the middle and cooler towards the end. Our fishing has been much the same, some days are great while others were a little slower. Overall we did have another great week which included including a few nice fresh silver bullets! Our rivers received a much needed bump in water but we certainly could use more. The Bonaventure is fishing well but we're having to work a little harder. The Petite 's water is low but the temperature is perfect, we continued to do well on the Petite. The Grand Cascapedia needed some rain and we receive enough to bring it up a foot late this week. Teo Panzer - He's 11 years old and was high rod for the week with 17 salmon to the net and a few more lost. Teo and his Dad Pancho from Argentina are regulars at Camp Bonaventure, they have become good friends as well. He' Teo with yet another salmon!, Well done young man! Teo does it again, the guides were joking that Teo needs a commercial license! Pancho Panzer (right) and Camp Bonaventure guide Carol Barriault with a nice one from the Bonaventure, congratulations Pancho! Joel Castleman have been coming to Camp Bonaventure for many years, Nice one Joel, well done! Jeff Beatrice landed this nice salmon on the Bonaventure, congratulation Jeff! see you next June. Don Grosset has been a part of Camp Bonaventure since Day one, Done is great friend to us all and a heck of an angler, Congratulations Don. See you next Year Don! A sneak peek from below! Tom Harkness has been a regular at Camp Bonaventure for over 20 years, here he is with a nice one from the Bonaventure, Congratulations Tom! Jeff Beatrice lands another! This is Jeff's 2nd trip to Camp Bonaventure this year, congratulation Jeff! , see you next June. Pancho Panzer from Argentina has been a regular at Camp Bonaventure, he gets out of the Patagonia snow this time of year. Pancho owns and operates Carrileufu River Lodge, a place every flyfisherman should go one day. Ten year old Teo Panzer, Pancho' son has been fly fishing since he could walk, believe it or not, he tied his father for high rod for the week. he he is with Camp Bonaventure guide Bruno Lepage. A chip off the old block, congratulations Teo! Michael French with his first Bonaventure salmon, needless to mention he was a happy angler! well done Michael! Camp Bonaventure regular Rick Koe sure knows how to catch them, congratulations Rick, see you next year! John Rocha is no stranger to Camp Bonaventure or salmon fishing, john is a great angler and gets it done everytime, nice one John! MarkMoorman with his first one of the year, congratulations Mark! The hot fly's for the week have been a mixture of dry's and small wets. Green, Blue and Dark Brown Bombers were responsible for most of the catches. In the wet fly department, the John Olin, Green Machine and Stone Ghost came out in front for the week. The John Olin and. Picasse were the winners on the Petite. The sizes that are working best are number 8's and 10's. Tim Ingram has been coming to Camp Bonaventure for many years,ne never fails to land a few big ones, Well done Tim! see you next year. This was Eric Roberts first trip to Camp Bonaventure, He landed this nice one on a dry fly, congratulations, Eric! 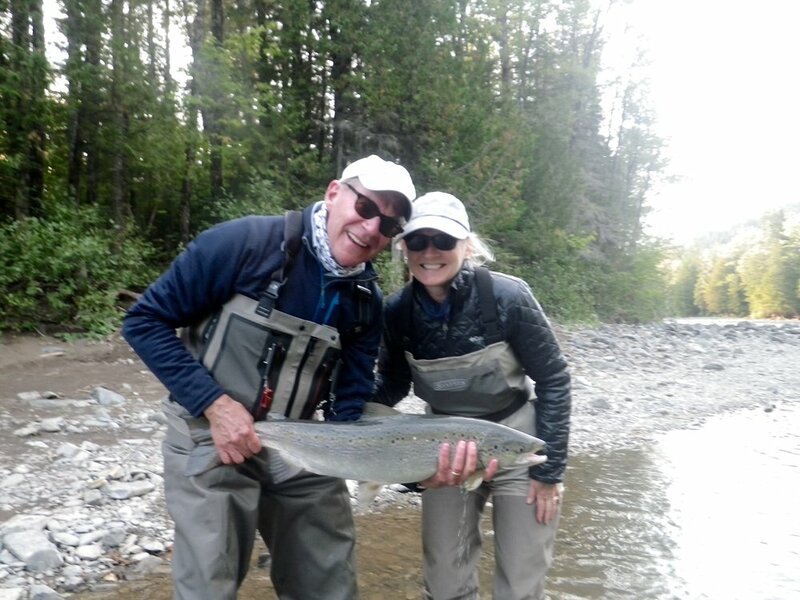 ASF Presdent Bill Taylor and his lovely wife Suzanne put one back to swim on the Bonaventure. Congratulations Bill! Keith Williams (left) with Camp Bonaventure guide Matt Flowers, nice one Keith ! Trevor Prichett was a happy angler on his first trip to Camp Bonaventure and his first Atlantic Salmon, congratulations Trevor ! Reid Pritchett with his first Atlantic salmon, way to go Reid! May it be the first of many. Glenn Prichett (right) and Camp Bonaventure guide Bruno LePage, Glenn landed his first salmon on the Bonaventure, Congratulations Glenn ! Martin Weaver does it again on his last dat, Nice one Martin! Steve Burns with a nice one from the gin clear Bonaventure, congratulations Steve! 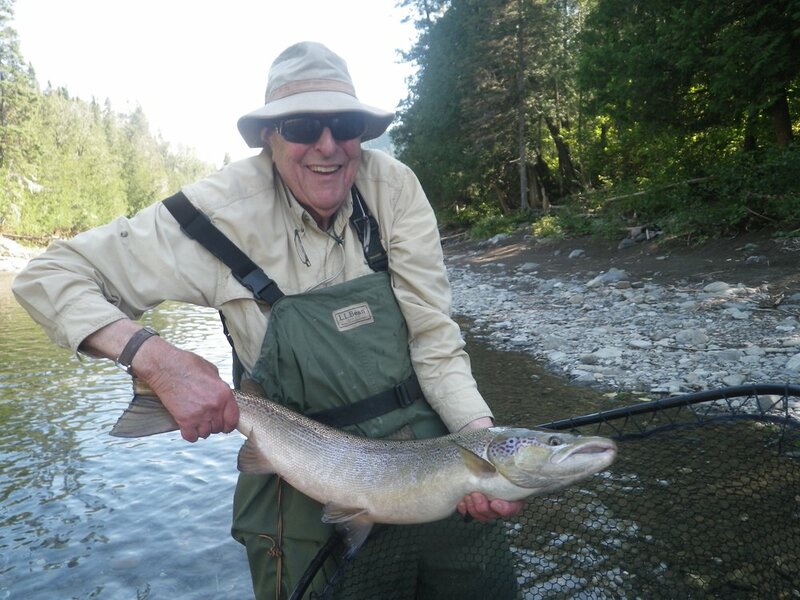 Camp Bonaventure regular Jean Charbonneau with his first one of the season, nice salmon Jean, see you next year. Our water may be low, but the opportunities are there for the taking. A few big ones holding tight to the ledge. Martin Weaver from Argentina has been coming to Camp Bonaventure for many years, this is his 21st salmon of the week! Need I say more. Keith Lovelock with his first Bonaventure salmon, Congratulations Keith. Peter Bennet (Left) with and his dad, John Bennett, nice one guys! Eric Forgie (Right) with Camp Bonaventure Guide Bruno LePage, this was Eric's first on a dry fly1, Nicely done ! John Ouelette (right) has been coming to Camp Bonaventure for many years, he and Camp B guide Carol Barrault are indeed a very happy pair. Darrell Sanders has been coming to Camp Bonaventure for almost twenty years, He's become part of our camp family, Congratulations Darrell, see you next year! Fred Benere has been coming to Camp Bonaventure for many years, he sure knows how to catch them, Good start to the season Fred! Brian Townsend says he gets out of Texas at this time of year to beat the heat, we really Know why he comes! Mac Fox on his second trip of the year to Camp Bonaventure, Nice one Mac, see you in a few weeks! Long time Camp Bonaventure guest Pierre Vezina with a nice fresh run salmon, Nice job Pierre! 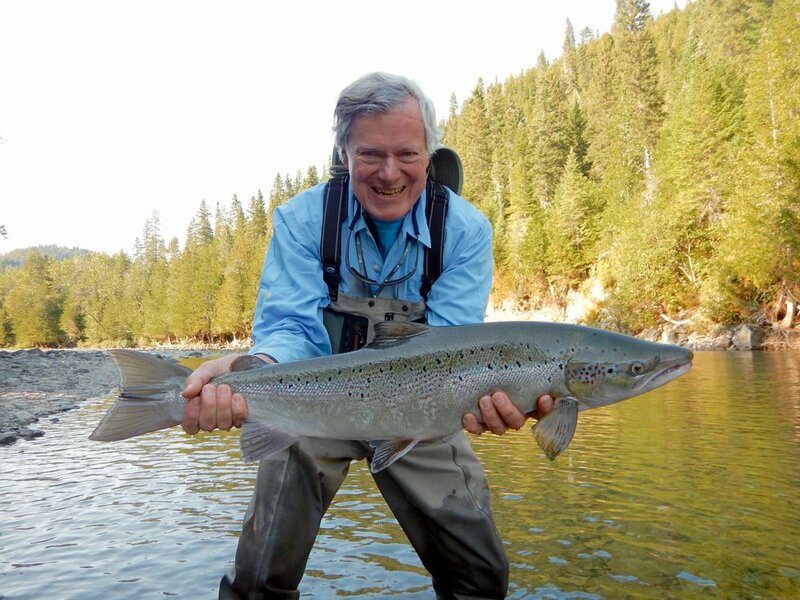 Mike Buzas is no stranger to Camp Bonaventure or salmon fishing, Mike caught salmon every day, Good fishing Mike! Dave Hatheway landed this nice grilse on the Bonaventure, a good start to the 2017 season. Congratulations David! Todd Morrison has been a regular at Camp for many years, a nice grilse starts the season well. Nice one Todd! Frederic Beauchemin lands his first salmon of the season, Congratulations Frederic! Marc Turcotte (right) has beenjoining us at camp Bonaventure for years, He and guide Mario Poirier landed this nice one after loosing 5 in a row! Finally one in the net ! Raphael Vezina (right) and guide John Law with a fine Petite Cascapedua salmon, Nice one Raphael! Suzie Moore has been part of Camp Bonaventure since day one! here she is again with another fins salmon. Welcome home Suzie! Tim Johnston lands this fine salmon on Billingsley pool just above the camp, Nice one Tim! Maitland Mclean has been a regular at Camp Bonaventure for years, he know how to get it done! Camp Bonaventure regularJonathan Director (left) and master guide John Law with a beautiful fresh run salmon, congratulations Jon! Bill Willson has been coming to Camp Bonaventure for many years, he and our guide Bruno LePage make a fine team! Bill Willson's son Douglas with his first Atlantic salmon, a chip of the old block! Well done Douglas. David Mann from Nova Scotia has been a regular at Camp Bonaventure for years, he knows how to catch fish, nice one David! Geared up and ready to go!!! Camp Bonaventure regular Mac Fox (right) and Guide Mario Poirier with a nice Bonaventure salmon, Nice one guys! Briar Bredenbrucher with a nice salmon, Congratulations Birgar, see you next year! Camp Bonaventure regular Maitland McLean with a nice one from the Grand Cascapedia, Way to go Maitland! Camp Bonaventure master guide Bruno LePage sure knows where the fish hold. Water conditions are perfect for our float trips. David Wood with his first Bonaventure salmon, Congratulations David! John Frost land a fresh run salmon on the Bony, Nice on John! Brian Snow from Fredericton with his first Grand Cascapedia Salmon, Good start Brian. The Stone Ghost does it again! The Bonaventure is getting a bit low for this time of the season, we could use some rain. Joe Colette with a nie early season salmon, congratulations Joe! Our 2017 season started off in fine form with Dan Greenberg landing the first one of the season on June 1st, a nice 24 pounder! caught on a Jean Marc Poirier tube fly. We are seeing fish and catching fish in our lower pools on the Bony on a regular basis. A couple if the 15 pound range were released by Joe Colette and Fiona Gilfilian . The middle and upper sections are also beginning to hold fresh salmon. Water temperatures are still cold in the 45 to 48 degree range and fishing from a canoe is the best approach at the moment. The Grand Cascapedia has fish throughout the whole river system, the pools are not loaded with fish yet but they are there. The Grand is in the 48 to 50 degree range. Fiona Gilfilian plays a nice salmon in front of Camp Bonaventure on June 2nd, Way to go Fiona! Higher water levels call for a bigger fly's choice. We have been catching our fish on no. 2's and 4's, patterns working the best this week have been the John Olin Spey, Magog Smelt and Picasse , all on tubes and spey patterns. It's still a little too early for dry's as the water is sit a little cold. Fishing buddies John Wemekamp and Jack Gustafson enjoy a nice lunch and a short break from he cold water. A good start to a new season, let hope it continues in fine form. 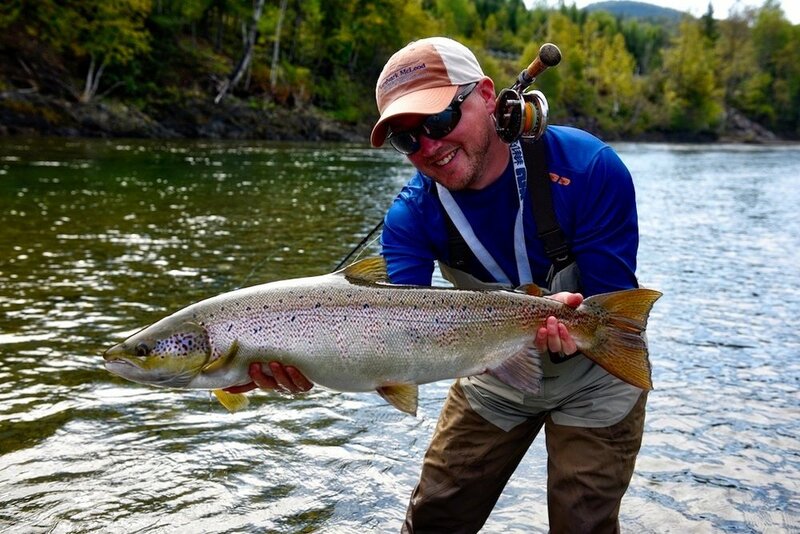 Dan Davala from Orvis Travel lands' this big male fish on the Bonaventure, wow, nice on Dan! Dan Davala does it again! 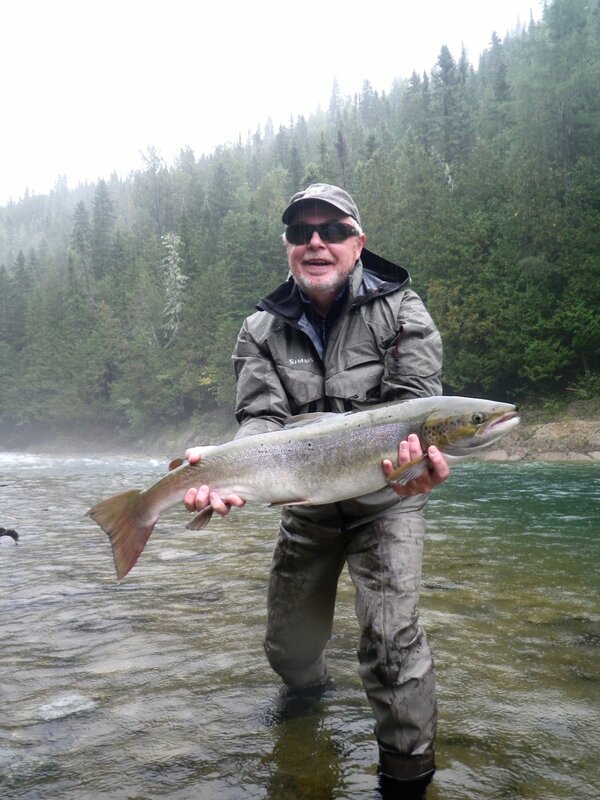 Camp Bonaventure regular Randy Spencer with a fresh run September salmon on the Bonaventure. Congratulations Randy! 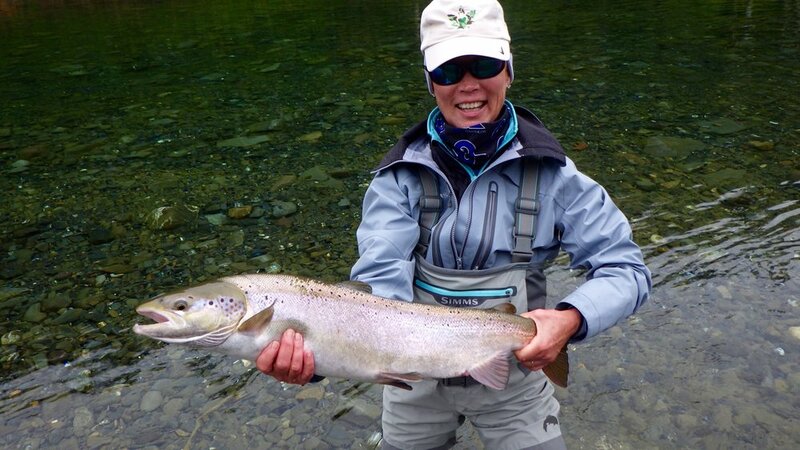 Anne Woods with her first Atlantic Salmon, Congratulations Anne! Michael Reilly landed this find fish on the Bonaventure, nice one Michael! Michael Sullivan with a fine Bonaventure salmon take in our upper stretch of the river, Nice one Michael. Michael does it again ! Wear entering the last week of the 2016 season. If you are interested in booking a trip for next season, now is the time to do it. We are filling up very quickly and space is getting hard to find. Give me a call or send me an e-mail, I still have a couple of great slots . Eric Czech with his first salmon one of the season, nice salmon Eric. Letting the cat out of the bag, The "Nagli" was the fly of choice last week! Camp Bonaventure regular Aaron Kennon with a beauty, Congratulations Aaron! Tim McDonald Landed this fine one on the Petite Cascapedia, Nice salmon Tim! Tom Harkness has been coming to Camp Bonaventure for many years, Nice one Tom, Congratulations! Camp Bonaventure regular Gianni Marostica with an nice salmon from the Bonaventure, Good fishing Gianni! see you next year. Robert Roy landed this nice on on The Bonaventure, Congratulations Robert! Philippe Duval took this fine fish on his last day, nice one Philippe!